My granddaughter, “Avery,” turned five last week. Her family will celebrate with me this Saturday. I’ve had her card for weeks, but had been dragging my feet on the gift. Last year, I got her a certificate to have afternoon tea alone with me at a tea room. We both enjoyed it. I decided to get her another such certificate. She has lots of toys. Giving her an experience she will remember seemed like a good idea. Her parents agreed. They suggested it, in fact. As of Wednesday, three days before the gift-giving, I hadn’t made it to the tea room. It’s a little out of range for a walk, so I was looking for a time I would be passing that way by car or bus. I also felt a little lacking in originality to give her the same thing two years in a row. On another mission entirely, I decided to research options for herbal tea to serve a crowd at an upcoming event. I dropped in to a tea shop I hadn’t frequented previously, a couple of blocks from my home. That was productive. I learned from the staff how to make tea concentrate to serve a crowd. 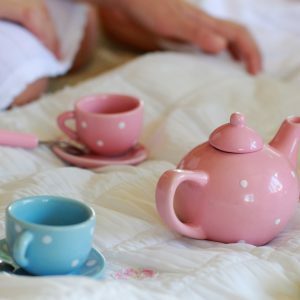 When I thought I had all the info I needed, I spotted the cutest little china tea set in a pink wicker picnic basket out of the corner of my eye. As the saleslady was packing it up, she assured me my granddaughter would be pleased. “All the little girls who come into the store go directly for that display,” she said. I am visualizing not one, but many, opportunities to have tea with Avery and her stuffed animals. Maybe we can also bake tiny cookies to serve on the polka-dotted saucers and use the wee matching, cloth napkins to dab the delicate crumbs from our faces. I’d still be giving her an experience, or, better, the potential for several experiences. Right? Truth be told, the little girl in me who would have loved a china tea set back in the day had come out to play. I have my fingers crossed the Avery will enjoy this one as much as I reveled in buying it. This entry was posted in Writing on August 3, 2017 by Wilda. Tea for three, maybe (says I hopefully). Hope is reasonable! There are four tiny place settings. One of Avery’s Care Bears could be part of the party, too.